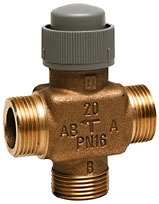 Additional description Valves are supplied with adjustment cap (not for on/off types). If the main-port (A-AB) is equal percentage, the B-AB port is linear. The valve capacity of B-AB is one stage smaller.